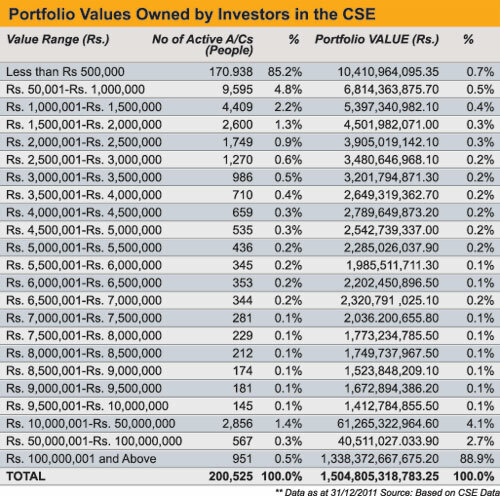 Just a fraction of investors in the Colombo stock market are responsible for the bulk of the transactions, data from the Colombo Stock Exchange (CSE) shows. The number of shareholders in the market rose by 32.6 per cent to 206,465 by the end of December 2011 against the previous year. Some 61,679 account holders had between 100 to 999 shares, while between 1000 to 9,999 shares are owned by 79,611 accounts, the CSE data says. It also says that some 2, 856 account holders control 4.1% of the CSE. Their value range in shares is Rs 10 million to Rs 50 million. Only 567 account holders hold 2.7% of the market and their share values range between Rs 50 million and Rs 100 million. The analyst said that these figures show that some 2.2% investors holding share value range between Rs 10 million and above control 95.7% of the market. “These ‘few’ people are the ones who are mostly affected by the CSE’s downturn,” he added. This is one of scenario people are moving fromCSE . the new trend is investing in USA. if any one wants to invest in USA or Dubai/KSA stock market PM me. @Uaecoindubai wrote: This is one of scenario people are moving fromCSE . the new trend is investing in USA. if any one wants to invest in USA or Dubai/KSA stock market PM me. මෙහෙම තියෙන කොටස් වෙළද පොළක තමයි කට්ටිය ගේම ඉල්ලන්නෙ.තමුන්ගෙ තරම දැනගෙන කල් අරිනු කිව්වලු.උන්ගේ ලාභ උන්ඩ විතරයි.අපෙ මාමා බිමින් යතේ කිව්වලු.